Pigment stains can occur anywhere on your body, but can be experienced as disturbing on the face, on the décolleté, neck and hands. Pigment stains are caused by UV light, or sun damage. Certain medication or genetic predisposition can also cause or worsen pigmentation. Acne and wounds can also leave pigment in the skin, often in the form of scars. In addition to reducing pigmentation, all our treatments are aimed at improving the quality of your skin. Through these treatments the skin is renewed from the inside and is stimulated to make collagen and elastin making it look shiny and feeling firmer. During a personal consultation with the doctor we make a skin analysis and look at the extent and cause of your pigmentation spots. Based upon this, we assess which treatment is most suitable for your skin and draw up a personal treatment plan. Pigment stains arise or are exacerbated by UV radiation. We advise everyone to be careful with sunlight. We also recommend using a cream with a protective factor, preferably VI Derm SPF 50. This cream combines a high antioxidant protection factor for your daily skin care. 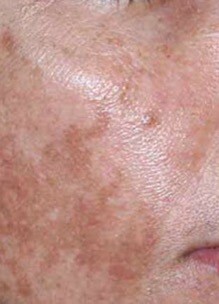 VI Derm also has a special line for the fading of pigmentation, VI Derm Transformative Skin Care System.